Hi everyone just a quick note to update you on a couple of things…. Firstly, I’m a bit angry at the moment because I feel like International Women’s Day is being dumbed down. Have you noticed? I’ve written more about it over at my new personal blog – here’s the link. And there’s an excerpt below that explains the key points that seem to be missing from the plethora of networking events we’re all being asked to attend. Secondly, to celebrate International Women’s Day (and perhaps in an attempt to manage my anger ahead of IWD! 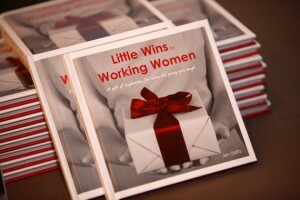 ), I’m giving away hard copy versions of my gift book Little Wins for Working Women during the month of March. You can order your free copy here. And there’s also a new e-book version you can download here. Feel free to share this offer with your friends, and if you’d like to place bulk orders for your team, please contact me ASAP so we can get it organised in time – there’s less than 3 weeks left til the big day. Finally, times are changing and we’re all busier than ever. So I’ve made a decision to turn off the automatic blog feeds that many of you use to read the posts as I publish them on The SheEO Blog. From now on, you’ll get one monthly email instead, with a simple overview of blog posts, news and offers. So, I hope this will make life a little simpler for you. International Women’s Day is being dumbed down. Have you noticed? This has been bugging me for a while but it hit a crescendo with an invitation landing in my inbox to an IWD event to be hosted by a national organisation for leaders. Tucked away behind the headlines of the stellar line up of television personalities, politicians and style icons, all getting together for a “long lunch” to celebrate “women’s big day” was the price tag: $199 per ticket. Another day, another invitation, another event: $135. Another day, another invitation, to yet another event: $95. On and on and on, they continue to arrive. Networking event after networking event after networking event. Has this become just another commercialized occasion, marked by attendance at yet another overcrowded event, in a nondescript five-star venue? And is it just me, or does anyone else think $200 is a lot to spend on lunch? Meanwhile, here in Australia, just under half a million women have reported experiencing physical or sexual violence or sexual assault in the past 12 months. In Australia, one in two mothers reported experiencing discrimination in the workplace at some point. And the national gender pay gap is currently 17.9% and has hovered between 15% and 19% for the past two decades, meaning that an Australian female performing an equivalent role to an Australian male will take home only 80 cents for every full dollar that her male peer earns. Globally, women make up half the world’s population and yet represent a staggering 70% of the world’s poor. Women make up 70% of the world’s working hours and earn only 10% of the world’s income and half of what men earn. And – particularly in the developing world – they are still too often denied access to basic education and health care. To be clear, I have $200 in my bank account that I could spend on that lunch: I’m thankful for that and there’s no doubt I live a privileged life. And that’s the reason why, this year, I’m choosing to do more. So this International Women’s Day, I’ve chosen to support three organisations whose work will continue long after the waiters have cleared the tables. They are some of my favourite charities, and I’m sure you’ll have your own that very much appreciate your support. And yes, I’ll be celebrating over the month of March, with many of my friends. And speaking out – loudly – on this issue at a charity event for my professional body. If you decide to get along to an organised event, please consider attending one with an appropriate charity partner. There are many to choose from. If you don’t have anything planned, why not get a group of your friends or colleagues together in your local coffee shop to reflect on your achievements and those of the women around you. You and your friends can order a free copy of my book – with my compliments – to mark the occasion. Because together we achieve more. Much more. And perhaps you will consider donating some or all of the book’s $20 retail price to a charity that supports women in need, be they in Australia or around the world. This International Women’s Day, don’t just be a passive participant. You can do more than that. You can be more than that. You are more than that. The question is, how will you show it?